Discover Lavazza Prontissimo! and get ready to live the real Italian taste experience... in an instant! 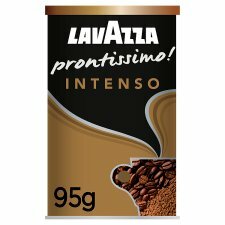 Much more than instant coffee, Prontissimo! is a 100% Arabica blend enriched with 10% finely ground coffee. Surprisingly rich and now with an even more tempting aroma: just one cup and you'll understand why Prontissimo! really makes the difference. Prontissimo! Intenso is strong and full bodied, with notes of roasted beans. Since 1895, four generations of the Lavazza family have devoted their lives to the pursuit of coffee perfection. Our passion, your pleasure.